At Christmas I was completely spoilt by my brother and his wife as they paid for me to go on a bread making workshop. 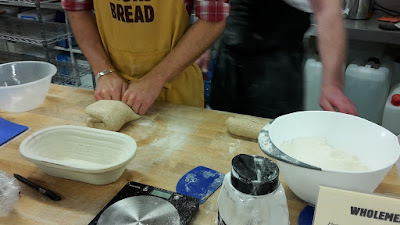 They know I love making bread, but it was after I came home from the two hour bread demonstration by Peter Cook a few months ago and I was really impressed by what he did that they decided to get it for me. I was glad they did! The course ran from 10 until about 4.30, it was really well structured and although Peter himself didn't run it Carl, the baker who took the course, really knew his stuff with over 40 years in the trade. He was also assisted by Ruth who was also very knowledgeable on the subject and she also kept everything running smoothly and provided us with drinks and snacks throughout the day. There was six of us on the course and it seemed a good number, we could (and did) ask questions at any time. 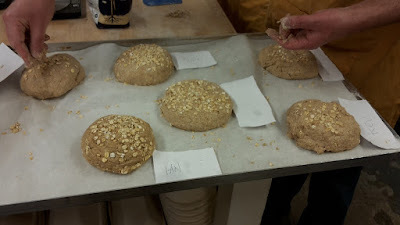 during the day we made five different types of bread, with proving times and mixing times working well to keep us doing something the whole time. 100% rye bread which was very sticky to mix! The loaves we made were a basic white loaf (although it didn't seem very basic compared to mine! ), 100% rye bread, Stoneground wholemeal, local ale & walnut and a oaty soda bread. What I really enjoyed was the hands on demonstrations then getting to try yourself, I think my kneading technique has improved no end, the way I'll roll my rolls from now on has changed forever! This is the kind of thing you won't get from a book. Also I ask many (many) questions through the day so hopefully my own bread will improve loads now as well! They put on an amazing lunch for us, the best I've ever had on a course. It's not very often that I'll fill up before the food runs out but by the end we were all stuffed and there was still more to go at! 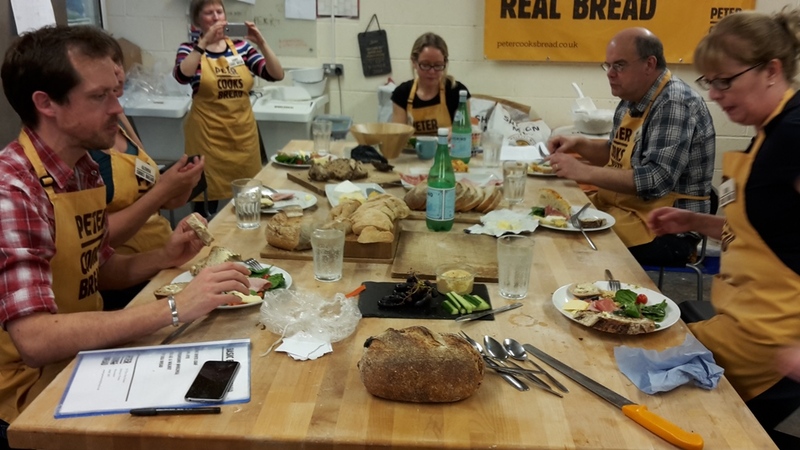 I think there was six or seven loaves for us to try, three massive chunks of cheese, a tray of cured meats and a salad, far more than we could eat and it was all delicious! 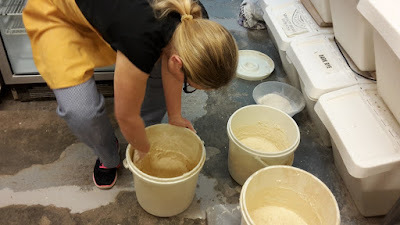 It was also really interesting being in a traditional commercial bakery and seeing some of the equipment they use and how they were set up, with charts on the wall to record times of when things were started and when the next stage was going to happen. 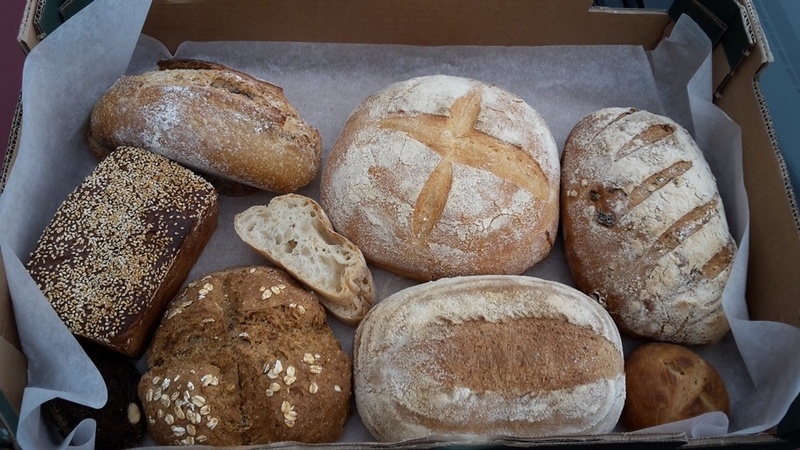 I came away from the day with a huge box of bread that I had made (see the top picture) and a recipe book containing the recipes for those loaves, I'm really looking forward to making some of them again. A brilliant day and one I'd 100% recommend to anyone interested in making bread, his courses can be found here if anyone is interested. I'm really interested in this, thanks for sharing. I might give it a go sometime, nice to see something local. I've always wanted to make sourdough too but I'm not sure I've got the patience. I love that it's people doing something local and in the best way they can, using the best ingredients they can. That is really nice, I have never seen anything like that here. Bread is such an ancient food it is strange that it can still be such a mystery to make. Sometimes I succeed and sometimes the dog gets lucky. Mine is normally pretty good, but it hasn't got the depth of flavour like theirs has but I do a very basic recipe, i'll be experimenting a bit more from now on though! What a valuable course that seemed to be, wish I could find one like that here. I started making all our own bread about two months ago and it is now routine to bake on Sundays. But, I can only make three types. Time to expand! Well done you. hopefully I'll go on the advanced one at some point in the future and learn even more! Yeah, I seem to stick to breads I can do with no recipe, I think I need to try more out with different ingredients! Since I've started making bread regularly it's been great, we've eaten so much better (but more of it). It's also helped us miss out a mid week shop where we'd go to buy more bread in the past. Now I buy flour in bulk and always know we've got some ready to hand! 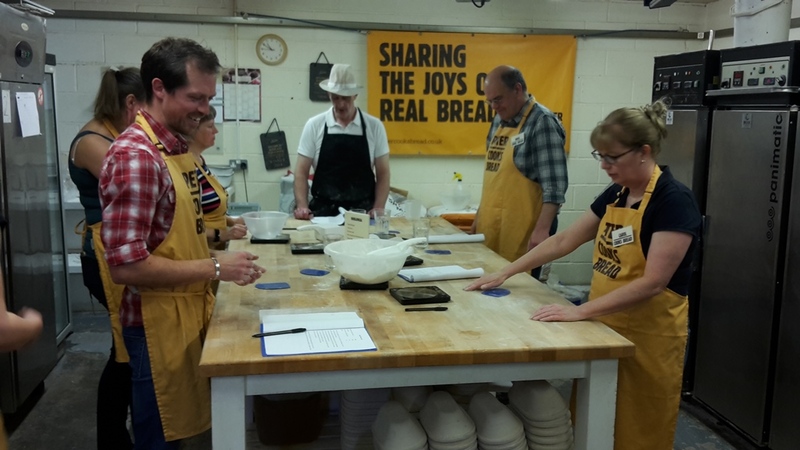 I carry on making average quality bread; I really would benefit from a similar course. I think something like this is a great way to make you think about making better bread, I hope that mine goes up tot he next level now! I only started making/baking my own bread a couple of weeks ago and I have to say, my consumption of bread has shot up from previously, where I rarely had it as I got so sick of throwing it away. I'd love to learn more at some stage, I am still at the basic stage, but loving the process, with a complete absense of machinery. 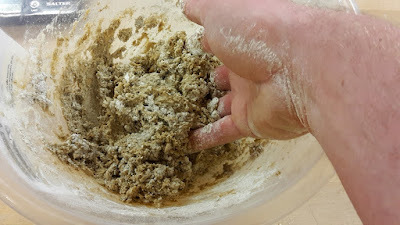 It's great, one thing I love is that when I make by hand I have no waste, I make what I think we'll need then do the rest as rolls or something that will freeze into portion sized pieces so my wife can take it to work easily. It's also great knowing what goes into it! Yep, the only downside to fresh homemade bread is that I want to consume more and more of it! It was a little too much for a gift to be honest! I was very pleased!